COME SEE WHAT ALL THE 'RACQUET' IS ABOUT AT THE YOUTH REGISTRATION EVENT IN CHARLOTTE!! Come out to the Youth Registration Event in Charlotte on February 28th at Jeff Adams Tennis Center. We will have size appropriate racquets for sale and the first 50 players to sign up will receive a free Jr. Team Tennis hat! What is USTA Jr. Team Tennis? USTA Jr. Team Tennis brings kids together in teams to play singles and doubles against other teams. It promotes social skills and important values by fostering a spirit of cooperation and unity, as well as individual self-growth. Also, it’s a fun environment for kids in which they learn that succeeding is really more about how they play the game – win or lose. USTA Jr. 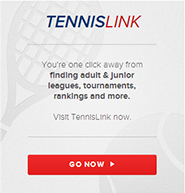 Team Tennis is designed for kids ages 6-18. They are immediately placed on teams. Remove next sentence. Matches can be held anywhere from a local park or school to a commercial or private club. Teams are preferably co-ed, and are divided by the following age and skill level: Age Groups: 18&U, 16&U, 14&U, 12&U, 10&U and 8&U Skill Levels: Beginner, Intermediate, Advanced. For more information about the program select the USTAJr. Team Tennis option on the menu at the left or click here.